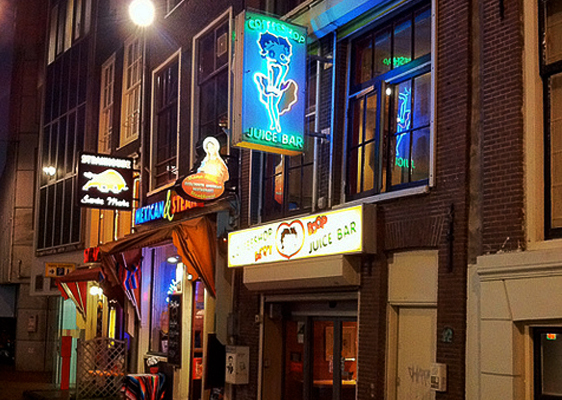 The 25 year old Betty Boop Coffeeshop sits in a square and off the beaten track, making it much quieter than a lot of the mainstream coffeeshops that can be found in Amsterdam. Although very minute, Betty Boop is split over two floors, so there’s somewhere to go if you want to escape the on-foot Amsterdam traffic for a while. The ‘budtenders’ here are always highly rated in reviews, with people stating they’re super friendly and make every attendee feel welcome while always being up for a laugh – which helps make it the perfect place to chill! The usual hot and cold drinks are on offer as well as grass, hash and space cakes ranging from €5 for a gram of Super Polm Hash right through to €13 for the likes of Mango Haze, Strawberry Sour Diesel, Dr Berzin Kush and everything in between. Betty Boop is a definite recommendation for you to visit on your time in Amsterdam.